Movie Review: Clash of the Titans- A Greek Epic Mess That Sacrifices the Original’s Dedication to Character, Story, and Purpose for Special Effects Nonsense | Generation Film! To some who look back on the 80s and others who just happen to be falling on the films taking a retrospective look one might immediately conclude that with all of modern special effects one can really improve the originals as popcorn entertainment. While CGI might make a film look good it never means that it actually is good, because spectacle and fast paced action segments simply replace character, intention, and narrative and just delivers mindless imagery rather than practical imagery. Berkley Breathed, the author and animator of the comic strip “Opus,” wrote a great article on special effects and emphasized the “special” and how we remember things like the Star Wars Star Destroyer in the beginning of A New Hope or the Nautilus in the old 20,000 Leagues Under the Sea because of how they were used selectively. These effects complimented the story in delivering good spectacle for well developed and intended use in relation to the story. Despite what one might think of the incredibly corny 80s film Clash of the Titans, which featured some inventive and ridiculously unique animation from Ray Harryhausen, the characters from the demigod Perseus to the flawed gods of Olympus all had intention, reason, and understanding to what their characters meant for the story being told. The effects were a means of completing the difficult segments of the plot such as the battle with Medusa or the giant Kraken destroying the city of Agros. In Louis Leterier’s remake of this easy to improve story of love all we receive is a formulaic CGI mess without any consideration to plausible character development and eventually just reeks of being carbon copies of action/fantasy films that have been done numerous times in the past couple of years. Something that could have ignited a fresh and devoted retelling of a classic Greek mythological tale, one of the only ones with a happy ending, turns out to be too much of the same tiresome special effects injected nonsense that lacks the wholesomeness that was evident in the original. Well the plot doesn’t differ too much from the original except for structure, theme, and tone, which is to say it’s the same characters in a completely unrecognizable tale. Some exposition in the beginning informs those who aren’t familiar with Greek mythology that Zeus, Poseidon, and Hades were all brothers who defeated the Titans to claim their power over the world by the use of the ultimate weapon known as the Kraken. While there are some minor truths to this tale, and Greek mythology is open for creative freedoms, there is already an undercurrent of not being able to comprehend the basics of the mythology tales especially in Louis Leterier’s description of Hades and his personal vendetta against Zeus. This is forgivable to say the least but when one doesn’t truly understand the original source it’s difficult to try and build upon it with your own interpretation. We are then introduced to Perseus, our protagonist, who was saved by a fisherman from drowning with his mother. They were both sentenced to death by her husband after he finds that Perseus was the offspring of Zeus who had relations with Perseus’ mother, making him a demigod. Hades power is growing because of distrust in the god’s among the people, and after he kills Perseus’ family who had adopted him at an early age, Perseus vows vengeance against Hades by any means necessary. This drastically takes a tangent from the original for Perseus in the 80s Clash of the Titans does all of his heroic deeds because of love for Andromeda who isn’t even the love interest throughout this entire film. So instead of love we have vengeance, already sounding more and more like every other film that is produced in Hollywood. As if getting the Greek mythology wrong wasn’t bad enough, such as Hades not having pride as the guardian of the underworld, Leterier had to mix in Arab mythology with weird looking Mummy-esque characters known as the “Gin,” which are actually Genies in the Arab mythology. Everything here has been done before and even when compared to its extremely lower budget and non-celebrity equipped predecessor, this Clash of the Titans fails drastically as any sort of original take on the Greek myth. Perhaps story isn’t the reason you’re going to see this film and most people won’t even bother to keep the basic essential to a film on their list of film expectations. So turning to the graphics and the over the top display of modern special effects the film still has no original bone in its structure. Everything from the fight sequences, camera movements, mild attempts at humor, and dialogue are all generic to the point that the experience of your eyes rolling every five seconds because of a corny dialogue exchange will be drastically more nauseating than the actual cheap 3D experience. That’s another aspect of cinema that’s going in the wrong direction and that’s 3D. Why do people want their films to be more like theme park attractions? Sure attractions don’t have to have a good story because it’s about the exhilarating experience or the spectacle of the ride. However, a ride is about the feeling of the experience while a film is supposed to be a story that connects with the audience usually done through relatable characters, intriguing depictions of familiar themes such as love, perseverance, or jealousy, and perhaps with a moral or message that story is trying to ultimately convey. A tale of love at first sight and the tasks needed to be accomplished in order to preserve that love have been eliminated from this Clash of the Titans and been replaced with simple, straight to the point, vengeance. With all of the flawed aspects of Greek gods and their pettiness, weaknesses, and personal feuds that can easily be applied to the story are non-existent here and all we have are caricatures of what we presume to be the gods. The film focuses too much on delivering high octane action rather than having that action compliment character, which there was no room for developing in this incessantly simple script. The cast is simply sub par at best and that includes comparing the overrated action star of the day Sam Worthington to the original Harry Hamlin. The original Clash of the Titans had incredibly known British actors such as the remarkable Laurence Olivier and the understated Maggie Smith, who made their characters understood if not trying to overstate their intentions. But can anyone really match the precision of Laurence Olivier? That would be unfair to Liam Neeson who seemed to be having a great deal of fun with his role considering that the script really didn’t offer much. As Hades there is Ralph Fiennes and it seemed the casting director when considering who should play the Lord of the Underworld immediately thought Voldemort and didn’t bother to venture past that train of thought. 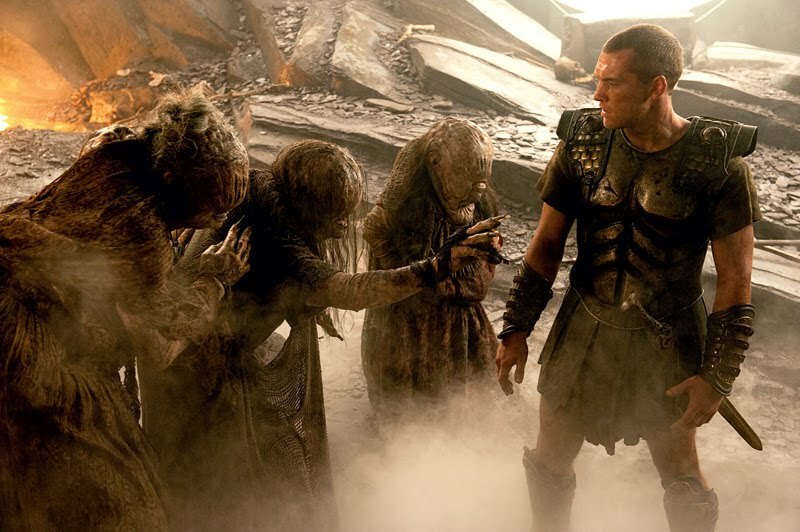 Sam Worthington is quite dry and unsympathetic if he can’t be labeled as completely bland, making it very difficult to really get through the entire film with a protagonist who has offered no reason to be connected with. Then the other roles are standard from the two eccentrics who offer bits of humor, to the no nonsense soldier who believes in you more than he lets on, as well as the woman who is incredibly beautiful and offers nothing to the screen except that beauty. 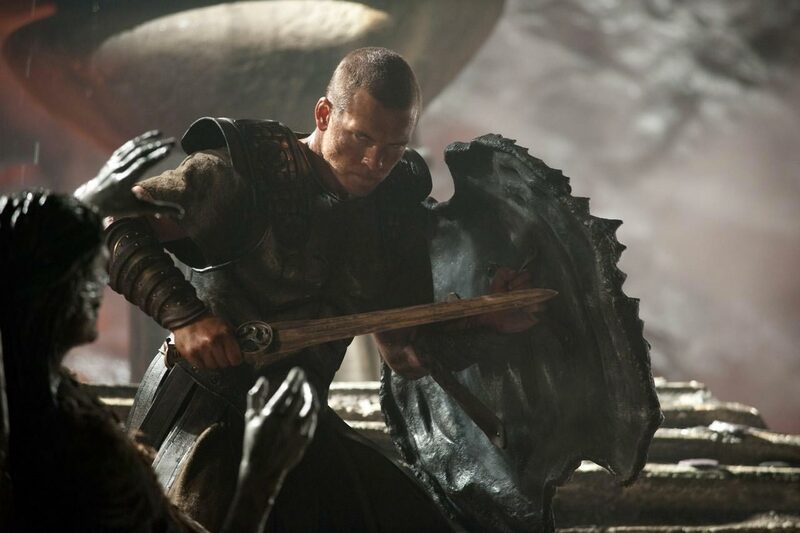 All of the characters seem as though they’ve been stripped from all of Stephen Sommer’s or Roland Emmerich’s films and placed into a sword and sandal film, which does have the possibility of being something more than generic action when you consider Ben Hur and Quo Vadis. Of course in cinema retrospect one can glance at the effects of Ray Harryhausen and say they are simply just corny or even ridiculous when compared to now. But so can the effects of The Day the Earth Stood Still or The Exorcist, which doesn’t make them any less viable as a time in cinema history when artists and filmmakers resorted to their creative instincts amongst drastic limitations. Limitations can be freeing and force us to make considerations as to how we can tell a story making the narrative the first and foremost priority. Special effects are no longer special when they are used in every sequence of a film and are no longer used as a means to tell the story and instead the story is fit in with how we can use the effects. The remake of Clash of the Titans attempts to reference its predecessor with some cheap gags and remarks but never respects the honesty that was evident in the original’s restricted attempt at telling an epic Greek myth. All of the pieces are there yet the intention of the story is drastically missing. With all of the wonders of modern filmmaking at their disposal they still fail to bypass the priority of filmmaking, which is story. There is no intention of character here but rather a tiresome display of familiar grandiose CGI that only makes for a slightly entertaining experience and definitely not an original one. Nice review. I thought that the movie was entertaining, but the ending was really predictable and oh so cliche.